Liam Watson has been appointed as manager by AFC Telford United following his end-of-season exit from Southport. 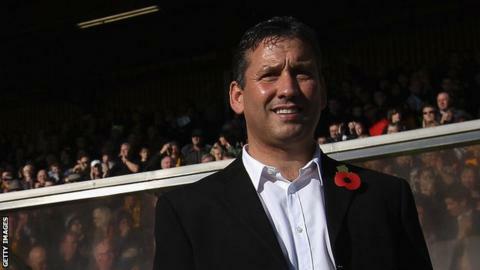 The 42-year-old, the club's fifth boss of 2013, has twice led Southport to the Conference North title. And Telford hope he can do the same at the Bucks Head following relegation from the Blue Square Bet Premier. "Liam Watson has a proven track record of developing clubs at this level into title contenders, " said Telford chairman Lee Carter. "The appointment of Liam Watson appears to tick all the right boxes for Telford. "He already has three promotions under his belt and leaves Southport with a great legacy. "His contacts in the game are second to none and I'm sure he'll be able to assemble a squad capable of bouncing straight back into the Blue Square Bet Premier. "Watson emerged as a late contender for the job, despite the club having talked to a number of candidates in recent weeks. "I understand once the club were made aware of his availability, they acted quickly to talk to him. "Caretaker manager, John Psaras, also interviewed well and I'm told he'll be offered a role at the club." "We will be working with Liam and his coaching staff to ensure he has all the tools he needs at his disposal to help us mount a challenge for the Blue Square Bet North in 2013/14." Watson's first appointment will be to install Southport old boy Dominic Morley as his assistant manager. Telford ended the season with first team coach John Psaras in charge after an extraordinary run of managers at the Bucks Head. After Andy Sinton was sacked in January, Mark Cooper took over for just a month before heading off to become number two to Kevin MacDonald at Swindon Town. Graham Hyde, who had been appointed number two by Sinton, then took over, but he lasted just 10 days before quitting on 11 March. Psaras was interviewed twice for the manager's job, but he will instead be now offered a role in the Bucks' development set-up, reports BBC Radio Shropshire. Telford suffered a nightmare season in their second campaign back in the Conference top flight, being relegated back to the Blue Square Bet North on Easter Saturday. They also broke a Conference record of 30 league games without a victory in the six months between a 4-1 win at Dartford in early October and the 3-1 win that relegated Ebbsfleet on the penultimate Saturday of the season.